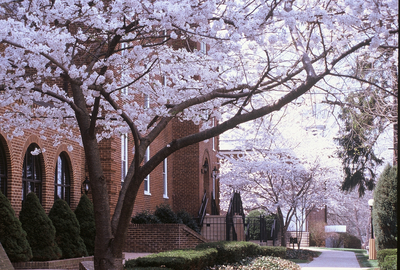 "Flowering cherry tree in front of Flory Hall, mid 1980s." by L. Michael Hill Ph.D.
Flowering cherry tree in front of Flory Hall, mid 1980s. Flory Hall is usually the first building prospective students and parents visit. It presents a pretty picture in the spring with a variety of species from the Rose family. Here is an early flowering cherry tree, Prunus sp., (Rosaceae), mid 1980’s.